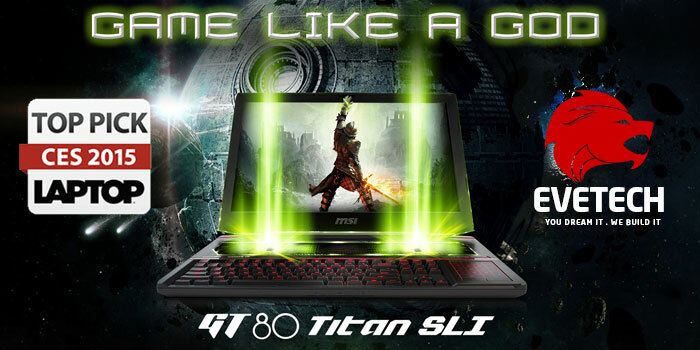 MSI has launched one of world’s biggest, meanest, most powerful laptops in existence with it’s brand new MSI GT80 Titan SLI gaming laptop. The GT80 is one of the first laptops to feature a mechanical gaming keyboard with Cherry MX switches, the same as in high end desktop keyboards, which give amazing tactile feedback and keystroke consistency. As well as a robust microswitch under each keycap for long life and reliable performance, the GT80 also features Lighting Control for dimming the keyboard illumination and a suite of programmable macro keys for speeding up in-game actions. Gaming laptops are typically too big to haul around, yet the 18.4inch GT80 is relatively svelte for its class. Weighing in at 4.5kg and measuring just 4.9cm at its highest point, the GT80 Titan is the slimmest 18.4 gaming notebook in the current market. And it looks great, from the beautiful design to the strikingly gorgeous 18.4″ WLED, 1920 x 1080 display that’s coated with a special anti-glare filter and has extra-wide viewing angles. Performance is in a class of its own packed with not one, but two insanely powerful NVIDIA GeForce GTX 980GM 8GB GDDR5 Graphics Cards running in SLI configuration, for unbeatably high framerates in the most demanding games. The powerful fifth Generation Intel i7 Processor, is paired with up to 32GB of memory for maximum performance too. You can be assured that this will be the most powerful notebook that you can get your hands on. For storage, MSI’s Super Raid 3 system can handle up to four solid state drives in RAID0 for read/write speeds of up to 1600MB/sec. Nothing will be able to slow in this laptop’s performance and it excels for gaming, workstation use, designing, photo editing and ultra high definition video work too…It’s all child’s play for the GT80 Titan SLI. As if that wasn’t enough, you can boost or throttle the GT80’s performance for faster framerates or a quieter room with MSI’s Intuitive SHIFT Feature that cycles through SPORT, Comfort and Green modes to get the ideal performance for what you are currently using it for. And even at the highest settings, the MSI Cooler Boost 3’s Ultra Efficient Dual Cooling System keeps this Titan of a laptop at cool temperatures and a quiet operating environment for uninterrupted gaming sessions, while the powerful DYNAUDIO sound gives you supreme audio quality and clarity with its unique 4 + 1 Speaker System. Laptop audio has been reinvented. MSI also gives you peace of mind. Beyond the standard one year warranty there’s an extended three year guarantee on all its GT80 Units. Evetech is the only company in South Africa, that has stock readily available, in any and every possible configuration available. Want more SSDs and memory, or a processor that will fit your budget? Check out the options on our site. You have the freedom to choose exactly how beastly you want it to be! Ultimate mobile gaming bliss awaits you. So what are you waiting for? jump into the fray with Evetech and prepare to get your mind blown. Click this link to discover the GT80 now.